Currently in Europe a blocking high, called an Omega Block, is situated over Western Europe due to a large bend in the jetstream causing heatwave conditions in England, Spain, Portugal, France, etc, with conditions likely to continue for at least several days. 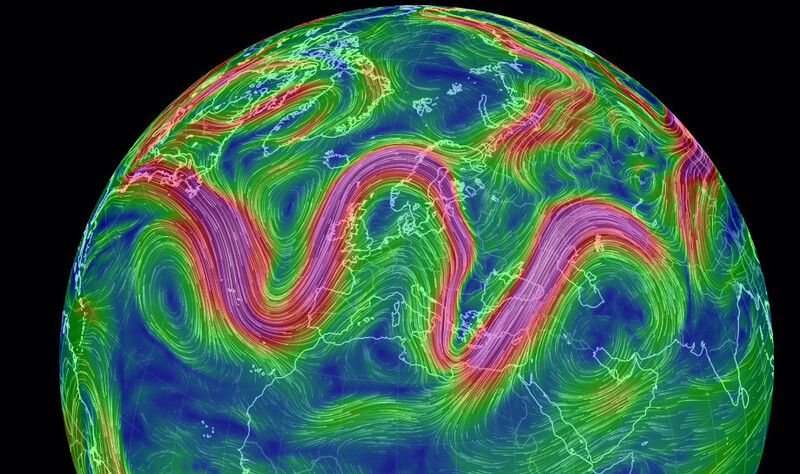 What causes the increased waviness in the jetstream? The reduced temperature differential between the Arctic and mid latitudes. These conditions are similar to the 2003 heatwave that killed 70,000 people. People are more alert now, but there is still a high health risk, and of course an elevated fire risk. I reported on how climate change is affecting extreme weather including more intense heatwaves in Arctic amplification, the Jet stream and Extreme weather in Northern Hemisphere in March 2013. A recent study published this year found that Seventy Five percent of heatwaves now attributed to climate change on a global level. Cities are also to get much hotter as heatwaves amplify the Urban Heat Island Effect. On Wednesday 1 July the World Meteorological Organisation (WMO) and World Health Organisation (WHO) jointly issued guidance on heat health alert systems. 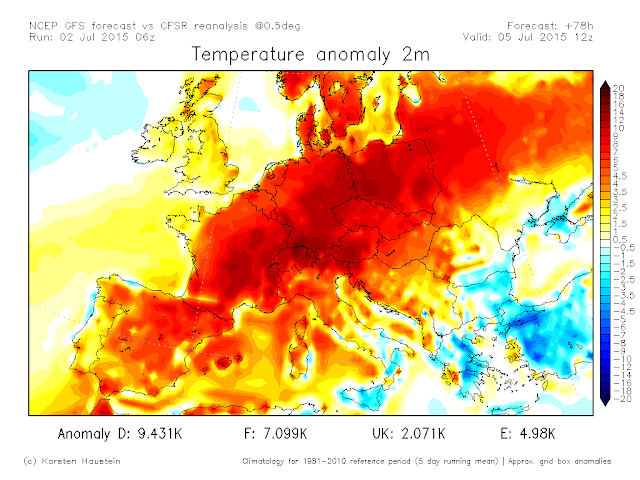 While France adopted a heat health warning system after the 2003 heatwave that killed 14,000 French citizens (over 70,000 heatwave related deaths across Europe), many countries still have no heatwave alert warning system and health risk education program. Indeed, we have just seen over a thousand reported deaths in the heatwave in Pakistan, and over 2,000 deaths in a heatwave in India in May and June. 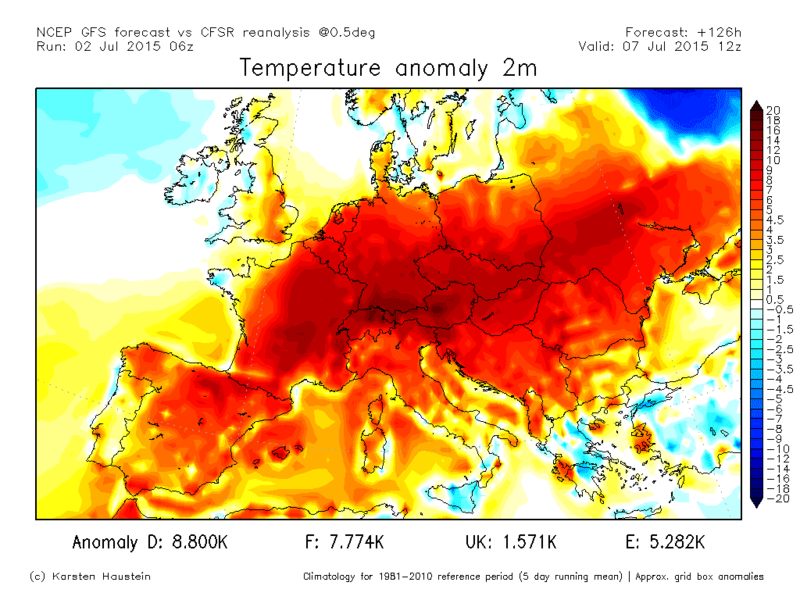 "We currently see record-breaking heat in Europe and the Western US. This follows two of the deadliest heat waves in history in India and Pakistan last month. Man-made global warming greatly increases the number of such heat waves: for example, record-breaking hot months already occur five times as often as they would just by chance without global warming. Such heat waves often come with drought and can result in crop losses, wildfires, and human mortality. This trend will continue if greenhouse-gas emissions go on unabated." 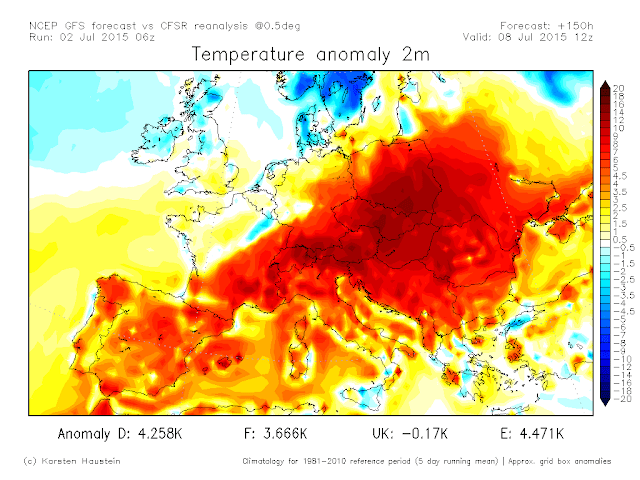 "The current European heat wave is due to a blocking high-pressure system which creates a persistent influx of hot air from the Sahara. Such circulation patterns are occurring more often in Europe in past years, likely related to a stalling of what we call planetary waves - giant airstreams, circling the Northern hemisphere while swinging from North to South and back. Our research indicates that upper-level atmospheric flow is weakening in summertime and this makes weather situations more persistent." Scientists from the Potsdam Institute for Climate Impact Research have done a number of studies to highlight the increase in extreme weather. 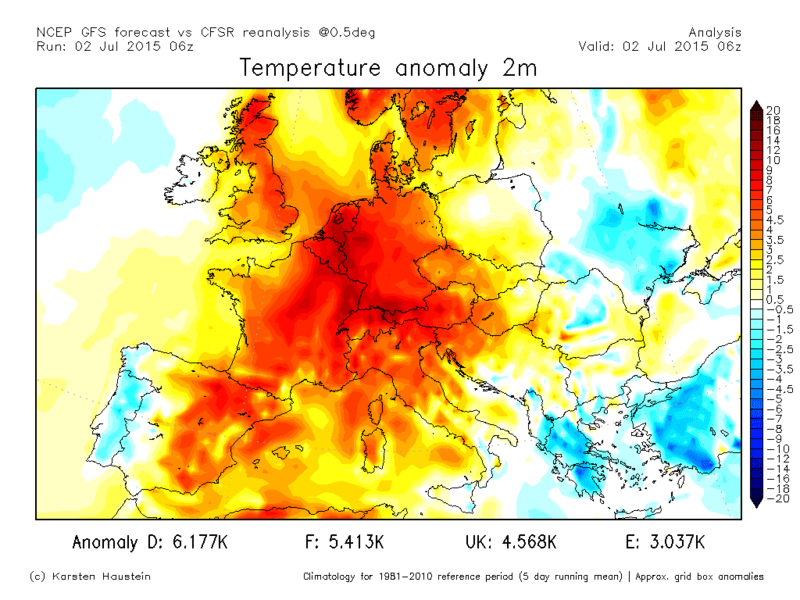 In August 2014 they warned that Trapped atmospheric waves triggered more weather extremes. In January 2013 research showed that Global warming has increased monthly heat records by a factor of five. Research in August 2013 predicted Multifold increase in heat extremes by 2040. We are seeing weakening summer circulation in the Northern Hemisphere mid-latitudes revealing that Summer storm weakening leads to more persistent heat extremes. "Particularly substantial influences include the contribution of increasing trends in anticyclonic circulations to summer and autumn hot extremes over portions of Eurasia and North America, and the contribution of increasing trends in northerly flow to winter cold extremes over central Asia. Our results indicate that although a substantial portion of the observed change in extreme temperature occurrence has resulted from regional- and global-scale thermodynamic changes, the risk of extreme temperatures over some regions has also been altered by recent changes in the frequency, persistence and maximum duration of regional circulation patterns." While people in hotter climates may be bemused at the reaction in Britain, it is the extent of the variation from local climate that really matters. 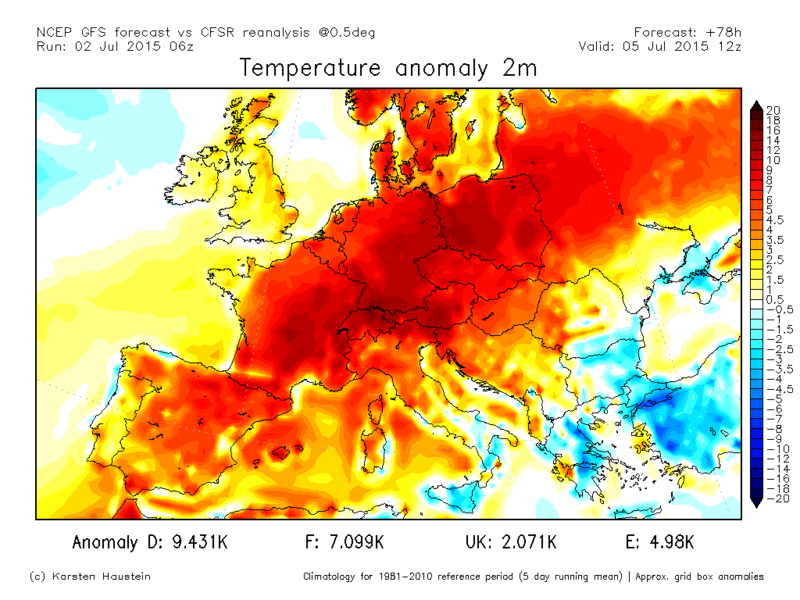 People in England are not acclimatized to extreme heat. We may see match interruptions to Wimbledon tennis tournament, like we saw in Melbourne a couple of years ago. Although many of the tennis stars have already experienced these temperature conditions playing in tournaments in Melbourne, Dubai or Miami. The health risk is probably greater to those in the stands. See Record heat sends All England Club scrambling. St. John Ambulance at Wimbledon, reported that 170 spectators had been treated and five had been transferred to the hospital. "I was fatigued and starting to get dizzy out there with the heat hitting me," Australian tennis player Bernard Tomic said. "It was tough, so I had to slow things down. I had to catch my breath. ... It was not that easy, that situation for me in the second. I was feeling bad. Hopefully I can get a good night's sleep in tonight." Tomic won his match against Pierre-Hugues Herbert of France. Women's tennis have incorporated a heat rule to allow 10 minute breaks, but there is no such rule currently in the men's tennis at Wimbledon. It now seems that Wednesday was the hottest day in Britain in 160 years with temperatures reaching 36.7 degrees. It was warmer in London than in Mumbai in India reported the Sydney Morning Herald. 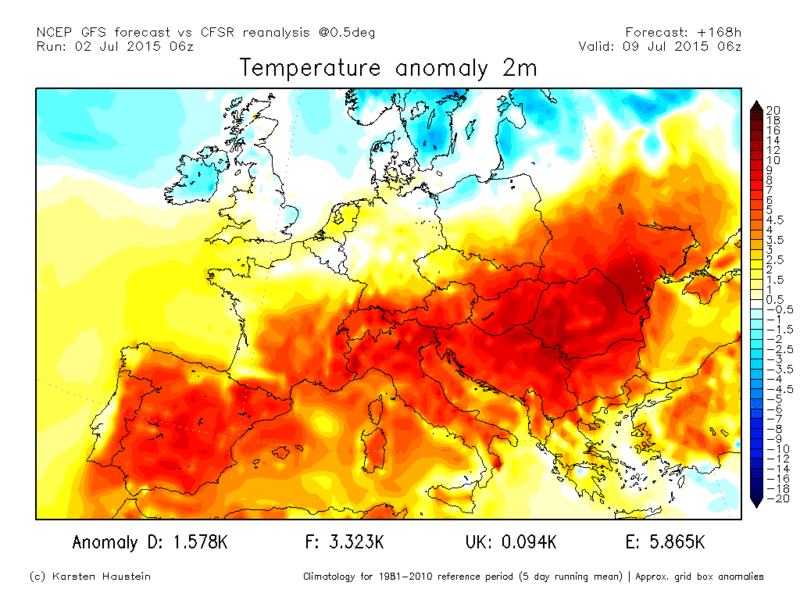 The BBC reported it was the Hottest July day ever recorded in UK. As predicted, roads melted in the high temperatures, and hundreds of trains were cancelled or delayed over fears that tracks would buckle due to the heat. Their was a 28 percent increase in calls and the number of call-outs in the London Ambulance Service to people who had fainted was up by more than a third when compared with last week. Weather warning alarms have also been issued across western Europe. For 2 July, a red alert was issued for Switzerland, much of central France and Belgium was under an orange alert, with parts of Spain, Italy, Germany, Austria, the Netherlands, and parts of France under yellow alert. Temperature Records were also broken in France, with new absolute records of 39.4 ° C in Melun, 38.3 ° C in Dieppe, 35.4 ° C in Boulogne-sur-Mer. Meteo-France recorded 39.7° C in Paris at 4:47p.m. It was the second hottest temperature measured in Paris since 1873, after the 40.4 ° ​​C recorded on July 28, 1947. Night temperatures have also been elevated across France, according to Meteo-France, with 24° C in Ambérieu, 23° C in Lyon, Le Havre, Le Mans, 22° C in Paris, Bordeaux, Angers, 21° C in Rennes. Rising summer night temperatures increase health risk disrupting sleep and reducing the capacity for people to recover to endure day time high temperatures. In all, 47 departments across France are under orange alert. And here is where France is headed unless global climate action is successful at Paris2015 COP21 climate talks in December. Most of Switzerland was under red alert, with afternoon temperatures in the cities in the mid 30 degrees. 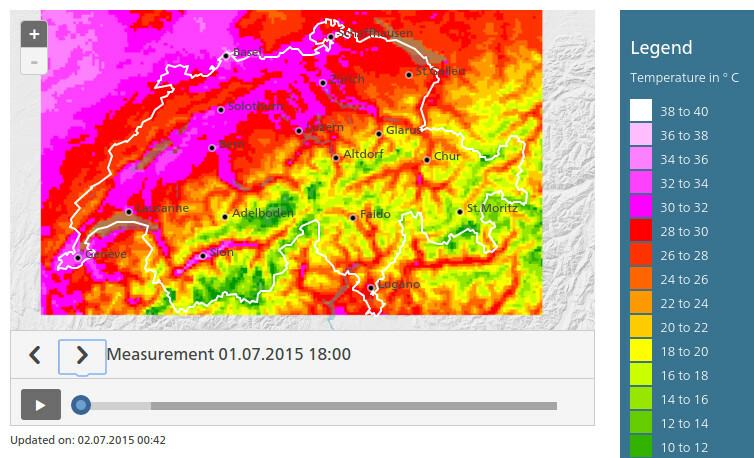 The temperature in Zurich is forecast to reach 34C on Thursday, and 36C on Friday, Saturday and Sunday. Dutch Public Broadcasting reports that Wednesday night (1 July) was the hottest night ever measured in the Netherlands. Temperatures did not drop below 24 degrees in some places. 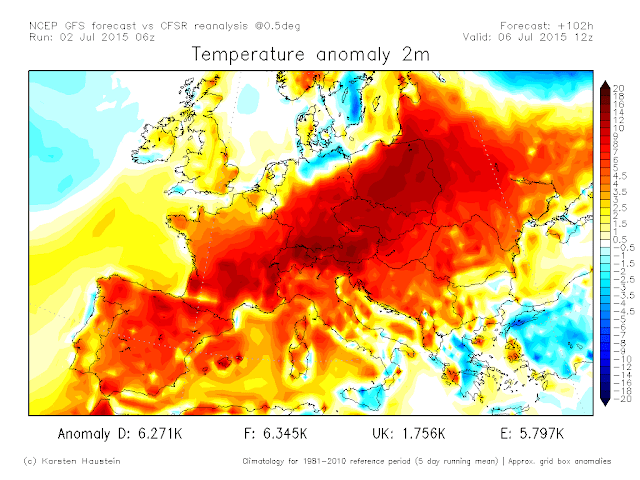 The previous minimum temperature record during a heatwave was 23.1 degrees in 2012 in Maastricht. It was the warmest July 1st on record in the Netherlands. Temperatures are forecast to reach 36 degrees in the interior, and possibly 41C on Saturday in the south. Of course, NL's extremely warm nights could have happened without global warming too. Once in a million years or so. 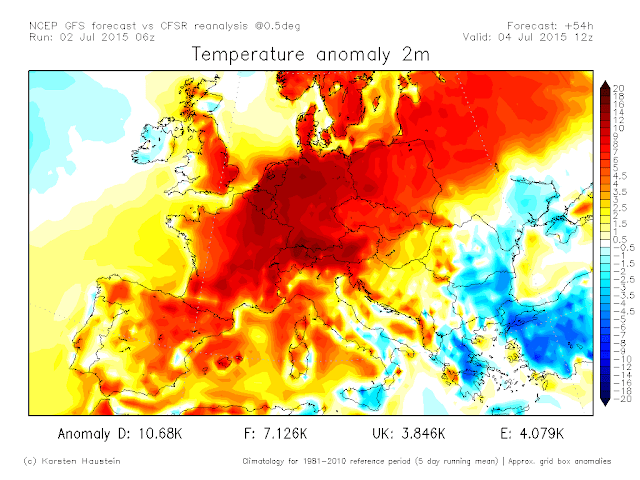 The heat is starting to spread east into Germany and Poland. "The hottest days in Berlin are expected to be Saturday and Sunday when the temperature will approach 35 C (95 F). Meanwhile, Warsaw is expected to reach a temperature of 32 degrees each day from Sunday through Tuesday." 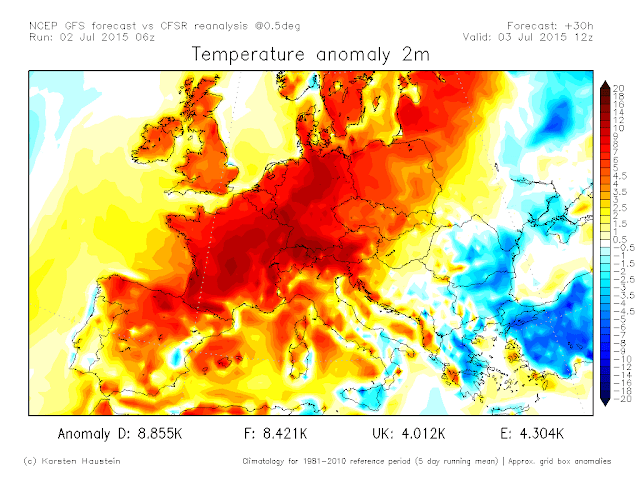 Temperatures started building on the Iberian peninsula last weekend. Madrid set a new June record maximum temperature on Sunday of of 39.1 degrees Celsius, only to eclipse this record on Monday reaching 39.7 degrees Celsius. Madrid's Adolfo Suarez Madrid-Barajas Airport on Monday afternoon reached 40 degrees Celsius (104 F), a first for June in records dating to 1945. At least four other locations in Spain set new June heat records Monday, in temperature records dating back to the 1950s. Cordoba, in southern Spain, reached a sizzling 43.7 degrees Celsius Sunday (110.7ºF).